Victoria tourism destinations have always been popular. Victoria is one of the coldest, but still densest inhabited states in Australia. And there is a good reason why. Melbourne is a fantastic city, and the state is full of great things to see and do. There are some lovely country towns, beautiful coastal views, gold history, ski resorts, whale watching, and the mighty Murray River. Some of the most obvious places to visit are Wilsons Promontory, the Grampians and Alpine National Park, and the Twelve Apostles and the Great Ocean Road; but of course, there is heaps more. Great Ocean Road. Poster by AllPosters. Click on thumbnail to buy. Melbourne is Australia’s San Francisco. Its multicultural atmosphere, its European-like street system, its trams and street musicians remind me a lot of my favourite city in the USA. With as many as 140 ethnic groups, Melbourne is one of the most cosmopolitan cities in the world. This mixture of cultures and cuisines from every continent in the world results in a variable café and restaurant scene, lively night life, and many festivals to celebrate. Melbourne is also known for its arts and sports venues, and it has got some excellent shopping, museums and city parks. Melbourne. Poster by AllPosters. Click on thumbnail to buy. On the north bank of Yarra River next to the Federation Square is the beautiful Flinders Street Station. North from here, you have the hub of Melbourne with some shop arcades, Chinatown (of course! ), and my favourite – Queen Victoria Markets. Further north is the Italian community Carlton, and the bohemian Fitzroy with countless bars and restaurants and a Spanish community around Johnston Street. East of the city centre are the famous Melbourne Cricket Ground and the Vietnamese Richmond; and west is Docklands – the former industrial docking area which, as in many other cities in the world has recently been turned into new quarters for shopping, dining and entertainment. Here is also the Telstra Dome where you can watch a game of AFL (Australian Football). South of Yarra River are the Kings Domain and the Royal Botanic Gardens, a few museums and galleries, and the Southgate Complex for wining and dining with views of the city and the Yarra River. Further south are the posh Toorak, and the famous seaside suburb St Kilda. As all the Australian state capitals, Melbourne has got its green getaways. Less than an hour southeast of the city is the Dandenong Ranges National Park - known for its tall forests, fern gullies and lyrebirds. More Australian wildlife can be seen in the William Ricketts Sanctuary, and a ride through rainforests can be done by the Puffing Billy Railway. Also, as all the Australian state capitals (except Darwin), Melbourne has got its wine district with about 40 vineyards in Yarra Valley northeast of the city. But what other state capitals haven’t got is the Mornington peninsula, in the end of which is the Mornington Peninsula National Park with some lovely beaches and coastal walking tracks. And then there is the historical Sorrento, and the rich Portsea, and what is special about this place, I warn you – be careful if you want to swim here. One of Australia’s Prime Ministers, Harold Holt, went missing when swimming here in the 1960s. He had apparently not questioned why the straight between Portsea and Queenscliff on the other side is called - The Rip. Dandenong. Poster by AllPosters. Click on thumbnail to buy. The rest of Victoria can roughly be divided into the historical west, the alpine east, and the beautiful southern coastline. On the coast, east to west, you have the spectacular Croajingolong National Park with coastal walks and sand dunes, the famous Wilsons Promontory National Park with superb views along 130km of walking tracks, and then the small Phillip Island where every night around 10pm, little fairy penguins come to the beach, an event called the Penguin Parade and I tell you, it's wonderful. West of Melbourne along the coast, you have Geelong - a nice town with some good dining and a lovely marina, Otway National Park with its thick tree fern rainforests, and the famous Twelve Apostles rock formations along the magnificent Great Ocean Road. Lakes Entrance. Poster by AllPosters. Click on thumbnail to buy. North from here, the inland western Victoria is known for its golden past. The historic gold mining towns Ballarat and Bendigo are interesting places to visit. In Ballarat is Sovereign Hill - a stimulated living gold rush town from the 1860s where you can enter the daily life of 300 people (actors) and 40 horses. West from here is everyone’s favourite - The Grampians National Park; and north are Echuca and Mildura where you can take a paddle steamer cruise along Murray River. The Grampians. Poster by AllPosters. Click on thumbnail to buy. Eastern Victoria is mostly high alpine country and a very snowy place during the winter. I know that most people don’t come to Australia to ski, but if you get sick of the heat, there are some excellent ski resorts in Mt Baw Baw, Mt Buller, Mt Hotham, Mt Buffalo and Falls Creek and Alpine National Park. Personally I’ve done too much skiing in my past. Mt Hotham. Poster by AllPosters. Click on thumbnail to buy. But I have to top this off with something different. 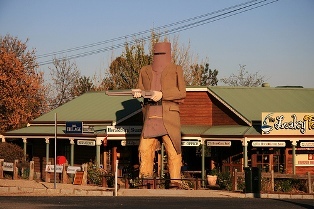 Heard of Ned Kelly yet? Here's a map of Victoria with places mentioned on this web page tagged. You can click on the tags to see what places they are, and double-click anywhere on the map to zoom it in and see the places closer. Drag the map to move around, and if you want to see the satellite image with Google Earth, click on "Sat" in the top right hand corner.